Have you had enough dystopian young adult book-to-film adaptations? Would you rather nix the supernatural creatures? Tired of love triangles? Not only is John Green’s The Fault in Our Stars dystopia, creature and love triangle free, but it’s also exceptionally grounded and moving. The story hones in on Hazel Grace Lancaster, a 16 year old diagnosed with stage-five thyroid cancer with metastasis on her lungs. She quickly loses her breath, travels around with an oxygen tank, and is always heartbroken over what her situation does to her parents, but she tries to be “normal” otherwise, taking classes at a local community college and watching as many episodes of America’s Next Top Model as possible. Hazel also attends a regular support group. That’s where she regularly sees Isaac who’s been plagued with eye cancer since he was young. One particular night, Isaac opts to bring a friend along, Augustus Waters. Gus was once a star basketball player, but after being diagnosed with osteosarcoma, he lost his right leg. Now in remission, Gus sticks by Isaac’s side as he hits a troubled spot in his recovery. But, while on Isaac duty, Gus’ eyes do wander and they land right on Hazel. For obvious reasons, Hazel has never really considered young love a priority and often shies away from relationships that could hurt the other party should her condition worsen, but Gus is different. He’s persistent and is fueled by such a raw, real passion, that despite Hazel’s protests, there’s just no giving in. At this point, after The Descendants and The Spectacular Now, it’s as clear as ever that Shailene Woodley is one of the top rising talents out there, but should she pull this role off, it’ll amplify that status tenfold. Minus her condition, Hazel truly does feel like a girl you may know. She’s a bit more intellectual than most and most certainly has an unusually vast knowledge of the details of her situation, but otherwise, she feels real. She bickers with her parents every now and then and is a die-hard fan of a particular book author, but she’s relatable on a far deeper level, too. While most can’t connect to that fact that Hazel lives every day of her life knowing it could come to a quick end, the points she makes about such a condition and how she feels about the people around her being sucked into it make so much sense. 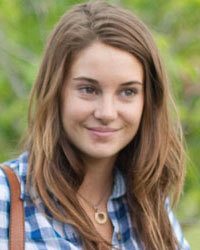 Why is Woodley prime for that type of role? Taking into account the characters she brings to life in The Descendants and The Spectacular Now, she can nail both Hazel’s sass and her unrelenting selflessness. Alexandra King in The Descendants has good intentions, but she’s also got some serious bite to her while Aimee Finicky in The Spectacular Now is kind and loving through and through, but also extremely susceptible to outside influences. Of course it’s not as easy as slapping two past roles together and claiming the mixture could spit out the ideal Hazel, but what Woodley brought to those two films does suggest she truly is the best pick for this part. 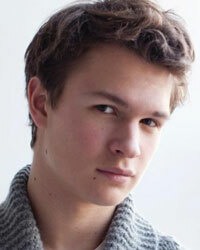 Ansel Elgort, on the other hand, is nearly impossible to assess because we’ve yet to see him in anything. That’ll change come October 18 when Carrie finally hits theaters, but in the meantime all we’ve really got to go off of are his looks and real-life personality. On the physical front, Gus is described as “long and leanly muscular” with “mahogany hair, straight and short.” It isn’t 100% necessary to match every feature, but Elgort does fit that bill well. And now this doesn’t necessarily speak to his ability in front of the lens, but at San Diego Comic-Con, I had the pleasure of meeting Elgort and he was a total charmer, much like Gus in the book. We spoke about his March 21, 2014 release Divergent and while his answers were packed with thoughtful bits on making that movie, he was also particularly warm and personable, making me suspect he’s a performer that takes his work to heart and on a project like this, that’s absolutely vital. And speaking about actors who take their work very seriously, Nat Wolff is the optimal choice for Isaac. Somewhat similar to Elgort, I’ve had the chance to speak with Wolff twice now, once when he was promoting Admission and again just before the release of another Josh Boone film, Stuck in Love. In case you aren’t of a rather recent Nickelodeon generation, personally or via kids, Wolff skyrocketed to fame alongside his brother, Alex, with their music and TV show The Naked Brothers Band. As for his acting chops, Wolff’s got it. Admission got silly every now and then, but it was a particularly grounded and dramatic big-budget comedy, and Wolff fit right in. Jeremiah had some major quirks and Wolff embraced and even highlighted them while also making Jeremiah a pleasurable person to spend time with. However, his role in Stuck in Love is a little more in line with Isaac. On top of suffering with vision troubles, Isaac is head over heels in love with his girlfriend and perhaps dedicated to a fault. 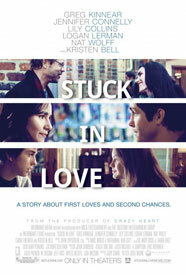 In his performance in Stuck in Love, Wolff shows that he’ll have no trouble representing and respecting Isaac’s romantic choices, while also ensuring that the big picture never entirely fades into the background. We’ve also got Laura Dern on board to portray Hazel’s mother. No need to justify Dern’s ability, but it is worth noting that Mrs. Lancaster is not what you’d expect from a character whose daughter is stricken with cancer. Unlike Gus’ parents who shower him with support and pepper their home with inspirational sayings, Mrs. Lancaster straddles the line between overly attentive caretaker and average mother. One minute she’s pushing Hazel to go out and make friends, but the next she’s a helicopter parent, and the fact that she’s so steadfast on both sides of that divide winds up making each standpoint more effective and also more troubling. You want Hazel to live out her days the way she wants, but you also don’t want her parents to lose her and that adds an extra layer to consider in almost every situation. The Fault in Our Stars is clearly not your typical YA-to-film property. The Hunger Games and Divergent demographic may flock to it to catch the stars in action, but this is some heavy duty and potentially troubling material. Personally, I’m not a fan of tearjerkers. It’s okay when a movie earns it, but for the most part I wind up crying because, according to that movie’s structure, it’s time for the viewer to cry and that just doesn’t feel fair. However, in Green’s book, he earns it. There’s no ideal existence that implodes in the third act; things are fairly bleak from the start. The point of the book, at least from my perspective, is taking those dire circumstances and finding the good in them and that’s what frequently made me tear up during the more emotional moments. But considering this is a book about kids with cancer, there’s also some flat-out sad material that’ll conjure the waterworks. But even then, it’s well supported. There’s this general sadness because it just isn’t fair for someone that young to be hit with such an illness, but then Green takes that sadness one major step further by ensuring that you know Gus and Hazel not just as characters, but as people and that makes that pang of sadness immensely more intense. The Fault in Our Stars will mark Josh Boone’s second feature, so our only sense of his potential here comes from Stuck in Love. The movie exhibits solid work all around, but there’s also no denying that it’s got weak spots. The film focuses on three different relationships – William and Erica’s (Greg Kinnear and Jennifer Connelly) failed marriage, Sam and Lou’s (Lily Collins and Logan Lerman) budding romance, and Rusty and Kate’s (Wolff and Liana Liberato) rather intense high school fling. It's only 97 minutes, so there’s just so much time that can be given to each and they all feel a bit thin because of it. However, ultimately, Stuck in Love is a highly enjoyable and moving family drama. The Stuck in Love script wasn’t particularly strong and if the Fault in Our Stars one is as powerful as the book, Boone already has a leg up this time around. Plus, Woodley is on an entirely different level than Collins. No matter the condition of the script or how Boone’s developed as an actor’s director, there’s an undeniable reassurance that comes with Woodley assuming the lead role. This could be what My Sister’s Keeper should have been. Whereas that film gave way to melodrama, The Fault in Our Stars won’t have that problem because none of the characters call for it in the slightest. No one mopes around wasting away in misery; they all recognize the situation and approach it rather practically so that when there are peaks of emotion, they come from circumstances that deserve it.